How do you create a blog business plan? What’s the best way to start a money making blog? One of the most overwhelming parts of blogging is…well, actually starting a blog. There’s so much info out there. There are so many blogging resources, right? Sometimes you don’t know who to turn to or listen to. You’re worried you’ll make mistakes. You’re wondering how to turn all that info into actionable steps. But after poring through tons of info online, you end up back where you started: Lost and confused. I realized most newbie bloggers feel this way because they’re not approaching blogging from a business mindset. When you treat your blog like a business from the get-go, your vision for your blog becomes clear. And the way you do that is by creating a superstar blog business plan you can refer back to whenever you’re feeling even a tad confused. Business plans exist to keep business owners on track. 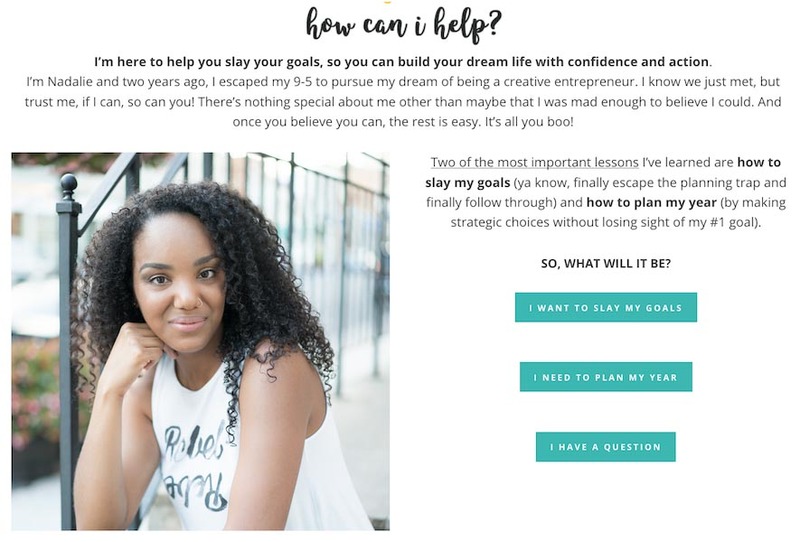 Below, I’ve outlined the *most* important steps to create a stellar blog business plan that’ll give you clarity, vision, and direction. Ready for a fresh look at your blogging dreams? Then let’s begin with Step 1 below. Branding isn’t just your visuals and how your blog looks. It’s how your blog makes your audience feel. So, how does good branding relate to your blog business plan? Believe it or not, a successful brand boosts customer loyalty and improves your blog’s relatability. Think of good branding as the way your audience connects to your brand. The stronger the connection, the better the brand loyalty your audience has. Every successful blog has a defined brand identity. You can get a glimpse of a blog’s brand identity based on personality traits that come to mind when you interact with a brand. What are some brand personality traits that come to mind when you read this snippet from Nadalie’s homepage? Notice how these personality traits make Nadalie, and her blog feel soo approachable. 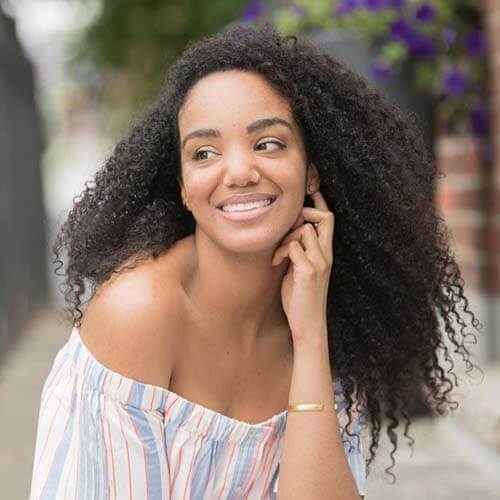 You relate to Nadalie almost immediately just based on her warm introduction on her homepage, making you want to stick around her blog for more. Define the top 5 personality traits you want people to associate with your blog. Make sure these are traits you value, too, since you’re going to be the face of your blogging brand. Down the line, make sure each interaction you have with your readers allows those personality traits to shine through. If you’re just starting out blogging, how do you know what’s the “standard” for your niche? How do you know the kinds of services bloggers in your niche provide? Or the way these bloggers monetize their blogs? An essential step of creating a blog business plan is knowing your niche inside-out. Getting to know your blogging niche is easier than you think. Why? Because you have a world of successful bloggers in your niche already! Great business owners understand the standard for their market and niche so that they know exactly how to stand out. This step is crucial in your blog business plan. 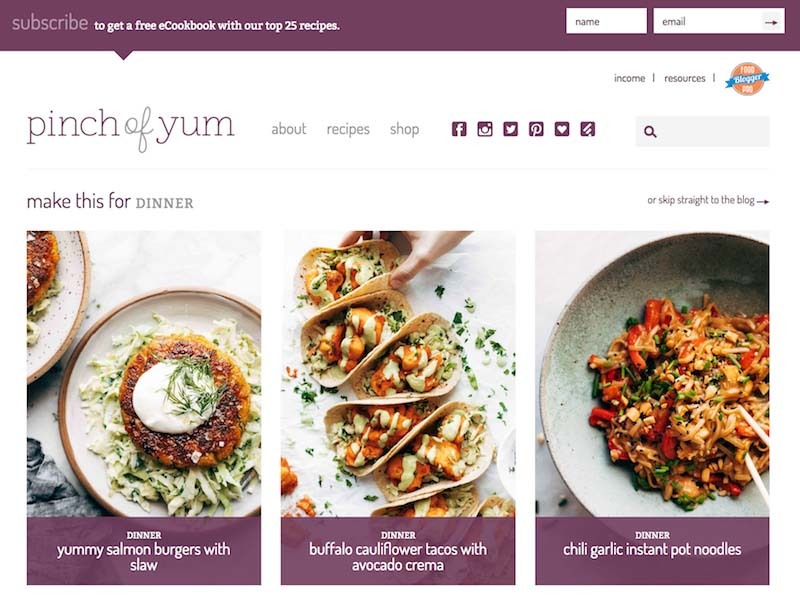 Your opportunities: hard to say; Pinch of Yum has great photography, recipes, and resources. However, they offer one main lead magnet — a collection of recipes — maybe there’s a better lead magnet I can offer here? Maybe a grocery list plus a collection of recipes? See how much information you can gain just by doing a bit of research from one blog? The lesson? Get to know your niche! You’ll be happy you did, and you’ll be prepared to take on the gaps in value for your audience. Research 5 top blogs in your niche. Get to understand their target audience, their opt-in offers, monetization methods, product and services they offer, and opportunities where you can do better. Ah, the USP. So misunderstood. And so often neglected by new bloggers as part of their new blog business plan. What’s a USP, you ask? The USP is what sets you apart. It’s the thing you want to be known for. It’s the thing you will be known for as your blogging biz grows. If you define your USP early on, you’ll be clear on the value you provide in your blog. If you don’t define your blog’s USP, then you’re in big danger of confusing not only your audience but also yourself! So, think about what it is you want to be known for. Do you want to have the most comprehensive collection of blog content for your niche? Do you get your audience fitness results in 30 minutes or less a day? Do you have the first-ever (proven) system for beating procrastination? Do you have lead magnets that are as good as paid products? 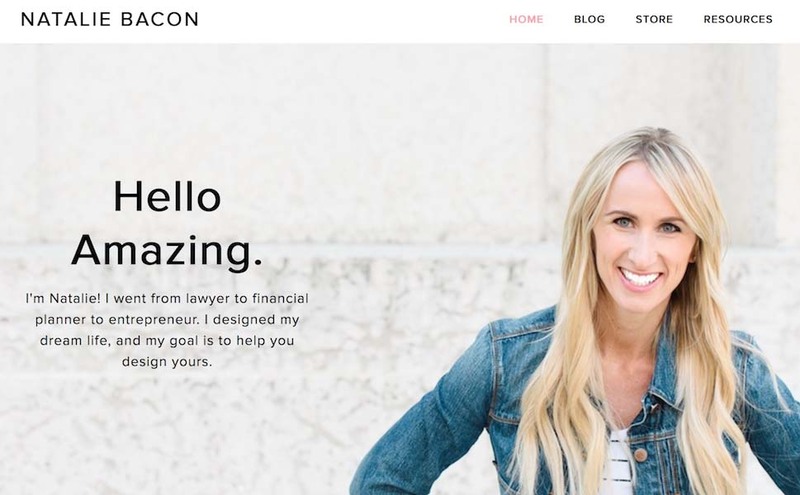 Can you figure out what Natalie Bacon’s USP is based on her homepage? 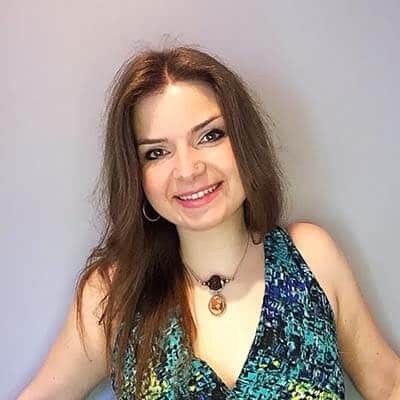 Natalie offers blogging and marketing advice on her blog. But a lot of other bloggers do, too! How is she differentiating herself from the competition? Natalie approaches teaching blogging from a lifestyle design aspect. This is what sets her apart and makes her stand out in her niche. There are limitless ways you can frame your USP for your blogging biz. Follow the exercise below to get ideas for yours. Define your USP! Jot down 10 different ways you can differentiate your blog from the competition. Just keep writing, even if the ideas sound crazy. Glance over your brainstorm when you’re done and ask yourself: What do I want my blog to be known for? Your audience is what keeps your business moving. Treat them right, and you’ll treat your business. The same goes for the converse: Neglect your audience, and you’ll neglect your business. That’s why it’s key to get to know your audience like the back of your hand. After all, if you don’t “get” your audiences biggest wishes, desires, pain points, dreams, hopes, fears, and pet peeves, how will you possibly provide services and products they’ll need? Doing a bit of research on your target audience goes a long way in your blog business plan. Don’t have an audience yet because you just started blogging? That’s totally ok.
You can get to know your would-be audience by checking out the comments in popular blog posts in your niche. Chances are, you’re solving similar problems as your competitors (but differently, of course). You can infer what your audience’s biggest problems will be based on what they talk about on fellow blogs in your niche. Go back to the blogs you researched in Step 2 and find their most popular blog posts. Check out the comments section and start to get a feel for how your audience talks and the issues they struggle with the most. Let’s say I was starting a blog that teaches how to be a successful blogger. Here’s one comment I found from a blog post titled, How to Write A Blog Business Plan. Notice the wealth of info you get just from one blog comment. From this one comment, we’ve learned that people who have already started their blog procrastinate writing a blog business plan. It seems overwhelming and scary to start, feelings echoed in multiple comments. You now have inspiration for a series of blog posts, lead magnets, and even a paid product just by paying attention to what people are struggling with in blog comments. Read through the comments from a popular blog post in your niche. Write down 10-15 things (big or small) readers in your niche seem to be struggling with. You can quote them directly, too. You wouldn’t have a blog business plan if you didn’t know how you’d make money, right? Thankfully, there are tons of way to monetize a new blog. And no: You don’t need thousands of page views to make money on your blog. You don’t need to sell a high-priced course. You don’t need to become an affiliate for every affiliate program out there. You just need to see what works best in your niche (based on research you did in Step 2) and go from there. I’ve found that most niches do well to start with a small introductory product, like a mini-course or an ebook, in the price range of $7 to $37. How do you come up with an idea for a product? Go back to the blog comments you found in Step 4! There’s plenty of inspiration in them for a paid product. And the best part is that you know your audience is genuinely struggling with this problem because they’ve voiced it in the comments. Go back to the comments you found in Step 4. See if you can group several of those comments together based on a central problem readers are trying to solve. See how you can package the solutions to these problems as a small information product (<$37). You need to know how you’re going to get traffic to your blog. That’s why every blog business plan needs a doable marketing strategy. Many newbie bloggers make the mistake of trying to be everywhere on social media. They’ll start a Pinterest account and start pinning. They’ll post to their Facebook page 2x a day. Or they’ll tweet 17 random quotes and generic links back to their blog. Here’s the problem with this approach: You’ll burn yourself out just as quickly as you started your blog! Here’s the reality: You do not need to be *everywhere* on social media. You just need to master one social media platform from the start. Why is that? Because every social media platform requires a certain skill-set for you to learn to grab that social traffic and redirect it back to your blog. 1.7 million monthly viewers on her Pinterest profile, with 27,000 followers. And her Facebook profile? 363 ‘Likes’ from the date I wrote this post. Now, this doesn’t mean the monthly viewers on your Pinterest profile or your follower numbers are a sign of blogging success (most of these numbers are vanity metrics). I’m showing you these numbers to prove that smart bloggers choose where they spend their time the most on social media. Pinterest clearly gives Adrian good results, which is why she spends most of her time there. I suggest beginner bloggers start off with Pinterest because it’s relatively easy to grow your organic traffic on Pinterest compared to other platforms. Start your Pinterest business account or current your current profile to a business one (it’s free). Add searchable keywords to your name and Pinterest page description. Next, create boards related to your blogging niche with searchable keywords, too. Start to pin relevant content (starting at 15 pins/day) to these boards, including your own. Do this consistently, and you’ll build your Pinterest traffic over time. If you want to have a clear vision on your blog, then a solid blog business plan is a must. Have any questions about your blog business plan? Having trouble finding a profitable blogging niche? Maybe you need some clarification on your blog strategy? Then ask away in the comments below! Ready to create your blog business plan? Alex runs the marketing blog, Unicorn Copy. Want to work out your blog’s business plan even more? Then download the One-Hour Blog Business Plan here. Very useful information and quite timely for me as I am redefining my niche, audience and steps to attract readers. Thanks for sharing and I am sure I will read your post again! I’m glad you found this useful! 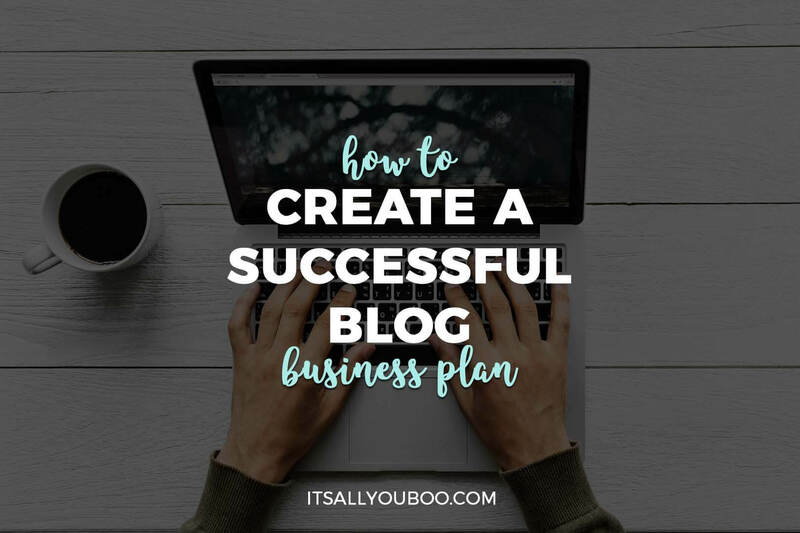 Creating a blog business plan is super helpful — I think most people forget we’re actually starting a business when we start a blog! When we approach blogging with a business mindset, we’re clear on our vision and goals from the start. All super great information. I especially appreciated the Pinterest tips. Thanks so much. I’m glad you found this useful! Yes, people tend to take the “firehouse” approach when it comes to social media, but it’s always best to start with one social channel and get really good at it. Pinterest is always a good start for (most) types of bloggers. 1) Pick a general category, like beauty, for example. 2) Keep posting and trying out different topics to see what YOU like to write about PLUS (and most importantly) what your readers love to hear about and what they find useful. But I don’t recommend your interests are as broad as gardening + beauty at once, for example (unless you’re spinning those two somehow!). And you don’t have to wait to grow your followers until you monetize. The beauty of planning out your blog from a business mindset is that you can create the foundation for monetization right away. Believe it or not, a lot of what makes monetization successful is understanding your target audience, growing your subscriber list and following, etc. The rest to monetization is simply tactics (which you can always learn). Hope this helps, and let me know if I can clarify anything else for you. Yes — people sometimes forget that blogging strategically is actually a business. The difference is that your services, products, audience, and “storefront” is all online. I’m glad this post has reshaped your approach to your own blog. Very useful resource, thanks for sharing. Wow this is an incredibly extensive guide on how to start a blogging business – you’ve thought of everything! I can’t imagine the pressure of trying to make money though your blog – it can’t be easy! I’ve had my blog for two years and I haven’t monetised it, I can imagine I’d be so stressed if I did! I’m happy you found this guide useful! Growing a business (online or otherwise) traditionally isn’t known to be a cakewalk… 😅 but that’s ok. You learn so much and I highly recommend taking a stab at monetizing your own blog, especially if it’s in a subject you and your readers are into. This is very thorough! Thank you! Glad you found it so! I tried to make it thorough without overwhelming, especially to any beginner bloggers wondering about monetizing a blog. These are all valid and helpful tips. I have been blogging for a long time and have been in-need of some refreshing. Nothing picks me up more than listening to other bloggers share what works for them. It really helps motivate me. I’m bookmarking this post so I can refer back to it when I have more time. Sometimes when we do something for a long time we get tunnel vision. That’s why I always read up on other blogs / industries / businesses entirely different than my own so I can keep “fresh” ideas and perspectives coming (something recommended in the book, Blue Ocean Strategy, which teaches you to tap into markets using unique ways, some even uncommon to your current niche). Excellent tips and strategies. This sounds like a plan for success. I can definitely use this. Thank you! Glad you found the advice useful! Thank you for these tips! I totally agree with the social media thing. You don’t have to be everywhere. Right now, I’m focusing on building my brand on Instagram so I spend a lot of time there than on Facebook. I agree with you 100%! Each social media platform is so unique and attracts its own unique set of users. Trying to be everywhere at the same time is just spreading yourself thin, right?! Glad you intuitively knew to focus on one and really nail it! Understanding your niche and your audience is indeed very important. And defining your brand of course. See what your goals are and where you want to take your blog. Niching down and speaking to your audience — these are so, so important! People can tell when you’re not speaking to them (what copywriters call, writing with “empathy”), and it turns people off. That’s why it’s good to know (even generally) who you want your target audience to be (a lot of this is also determined by your niche or blog topic!). You always give such a great advice! Thanks! It is good to have a plan! Yes, I agree — plans are good because they prove you gave it some thought. Especially if you’re starting a blog you want to monetize, a business plan puts the “big picture” into perspective. I think the ONLY downside to plans is sometimes people try to follow them to a “T” without giving themselves some wiggle room (because life happens, right?). Thanks — I tried my best to make this beginner-friendly! I agree! A unified brand reminds you you’re working towards some greater vision, right? I think there’s something powerful in deciding, “This is what I want this to be,” when it comes to your brand choices. It’s also important for consumers. Creative directors at large-scale companies spend millions each year just on branding and brand awareness campaigns. They understand how important a brand is to a consumer — branding is what lives in people’s perception, and good branding boosts memorability, positive impressions, etc. As an example: think of the “Amazon Prime” tape that comes wrapped around your Amazon shipment. Why would Amazon spend the extra money to print this on packing tape? It’s brand awareness, and you seeing their logo reaffirms how happy you are with their speedy, 2-day shipment. So, to wrap up my point, I’m glad you took the time to focus on solidifying your brand — I’m sure it was worth it! This was super informative. I’ve never given too much thought to my brand’s personality. Hmm…I’m sure I have one though. Thanks also for the examples. One the best posts I’ve read on this subject. Well done. Very well done. Check my response to the comment above for a bit of what I had to say about branding and brand awareness and how they impact readers, consumers, etc. I’ve worked with some clients who didn’t narrow down their brand and this reflected in their other areas of business — their product was often all over the place, the content wasn’t consistent, etc. Not that a lack of a brand directly means your product or content will be bad. But a unified brand DOES mean you gave all these elements a lot of thought. Usually, When someone has thought deeply a bit about their 1) niche, 2) own personality, 3) audience, and 4) what they want to sell, the brand starts to form itself and they just need to solidify certain elements (visual, “messaging,” or otherwise). Thank you for writing such an informative post! Now I am focusing on Pinterest as well as I can see most my page views from there! YES! That’s the best thing you can do! It basically says that 80% of your results come from 20% of your efforts. This has been observed in MANY areas, especially business (where we seem to chase every “shiny object,” thinking each shiny object is our one-and-done solution). That means *most* of what we do to achieve a certain goal doesn’t push the needle much. I like to think in terms of efficiency and when I’m working with clients and bloggers; I always try to find that “golden egg” of an opportunity they have — the thing that’s working FAR better than anything else — and scale, scale, scale it! So, if you find that Pinterest works for you, then by all means, use it to skyrocket your blog’s growth. And don’t focus on anyone suggesting you try anything else until you feel like you’ve mastered Pinterest and everything you can get out of it in terms of traffic (test different strategies, different images, on-image text, call-to-actions, etc). It’s important to develop a relationship with your audience. You just never know when a reader might turn into a customer for a brand you’re working with. It’s happened several times throughout my blogging journey. 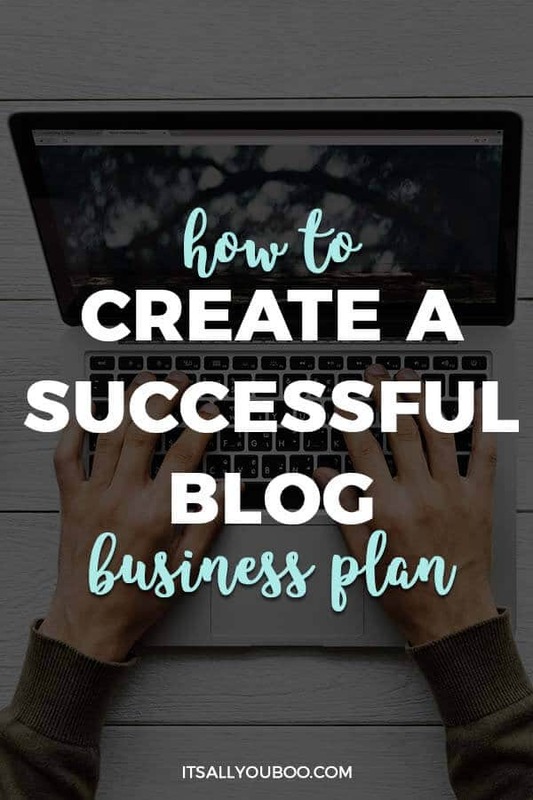 What a wonderful informative post about a blogging business plan! I’ve bookmarked this for reading a second time to completely absorb all of the advice and suggestions. I enjoy learning new things every single day! Thanks for bookmarking and feel free to reach out to me or Nadalie if you have any questions. Yes, I agree, a lot DOES go into creating a successful blog. That’s why I’m ok with people frontloading some old-fashioned planning in the beginning so they know what they really want out of their blogs and the overview of how to get there. This is very informative! This is one of those things where I wished I have done/known before I started blogging. 1.7m monthly viewers??? That’s one of my #goals!!! I have bookmarked this for future reference! Ah, yes — but we all have to learn by trial and error at some point, right?! 1.7m monthly viewers is a bit, isn’t it? Adrian now helps people grow their blogs using Pinterest (she got really good at it herself, after all). Great tips here. Good to have your blog strategy and plans written out for clarity. Yes, I agree — As I mentioned in the comments of this post, the clarity you get by mapping all of this out in the beginning is invaluable. Wow, such a thorough advice. Really great tips for newbie bloggers. It’s been 11 months since I have been blogging for fun. Your post will help me take my blog to the next level. Thank you! Always, I get reminded when I visit your blog that being organized is the way to go…I hope I get to apply these. Bookmarked! I’m glad you found this post useful, and I’m excited for you to apply them to your goals. Nadalie has tons of great posts on planning and organization on her blog, so I suggest checking those out, too! THIS is actionable and helpful. When I started out I pinned ALL of the blog tip pieces yet I didn’t ever find a good step-by-step, until yours! THANK YOU and I hope all new bloggers find and can execute their best blog with your tips. Years ago when I got into marketing and consulting, I also found a lot of lame-o “fluff” posts that didn’t help. Fortunately, for people like you and me, we can learn from others’ mistakes and avoid creating content that doesn’t help (or worse, frustrates) our target readers. No one likes “fluff” posts and these kinds of posts actually build a poor brand identity — people will start associating a name with bad content. Chances of a reader coming back to visit those sites again? Close to zero, you bet. 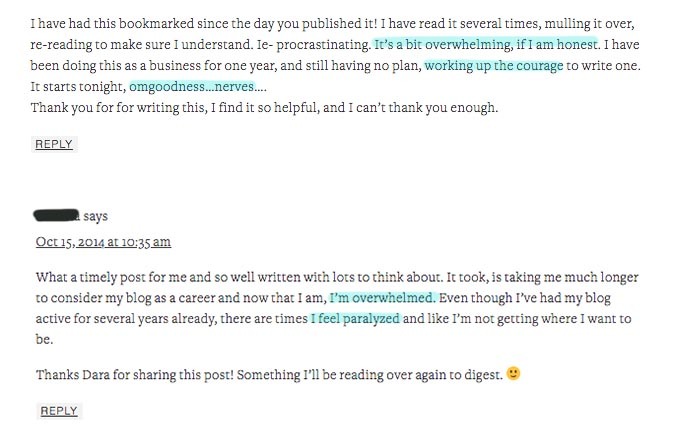 That’s why I love blog’s like Nadalie’s — you can tell the author cares about her readers and what’s in it for them. Happy this helped you, and hope you can apply these tips to your own growth strategy! As a marketing professional, i must say your blogging business plan is comprehensive and covers all that one needs to think about when starting a new venture! I felt a little sheepish throwing around words like “USP,” thinking it would be irrelevant. But I see blogging as a way to grow a business and I’d love for those who are in the business of blogging to start using terms like these more. I think applying business-sense to blogging will remove some of the “mystery” blogging tends to have around subscriber growth, making money, etc! Very informative and insightful. Thank you for the advice…Now I am still struggling how to make money..Adsense or Amazon affiliate? Typically, Adsense doesn’t offer high payouts, so people avoid it for that reason. However, since you’re just starting out monetizing, I actually recommend you try both Adsense and Amazon affiliate. Adsense requires pure traffic to make money. Amazon affiliate requires traffic AND strategic content + affiliate marketing to make money (like where you would place affiliate links, how to get people to click through, how to get people to engage with your content in the first place). It doesn’t take much to set up Adsense — it’s mostly a “set it and forget it” thing. And making money off Amazon will require some more strategy in content and affiliate marketing, as I said. When you’re starting out, focus on nailing down your strategy — see, for example, what can drive the most traffic to your blog, and what blog posts resonate with your readers the most, which posts they tend to click on, which affiliate products they like, etc. Once your narrow this part down, then you can focus on scaling and making more money. P.S. And of course, my best recommendation will always be to create your own mini-product first as your main monetization strategy!